It mines about 7 items per single unit of coal used to fuel it, producing 0.25 items/s for copper ore, coal, iron ore or stone. Burner miners create a lot of pollution per item. Burner drills are usually used until the player has built an electrical network, at which point the larger and faster electric mining drill becomes more useful, though they can still provide some use as extra drills that take up less space. Both methods require no electricity. Two burner mining drills can refuel each other when placed next to each other on a coal deposit as long as they're facing each other. Each drill fuels the other and coal gradually accumulates in their stacks, so you have effectively a storage of 100 coal (2 stacks, 50 coal, one in each burner miner, together 100). You can do this also for 4 or any other even number of miners. 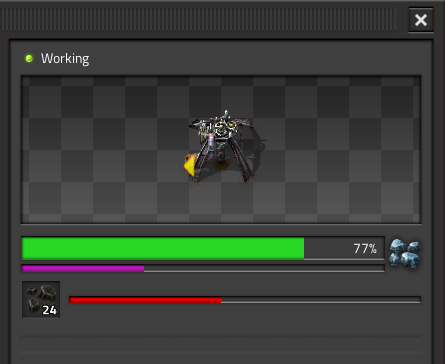 Note that it takes slightly less than 3 minutes for the mining drills to completely fill each other's fuel inventory. Once full, the drills will sit idle until the accumulated coal is removed. It's possible to extend that time by having the drills output their coal into a buffer chest rather than directly into another drill's fuel stack. This method can be used for any number of burner mining drills in a coal deposit. Place a burner mining drill, then place at least three transport belts from the output in a mirrored "L" like shape so that the third belt has a gap between it and the miner. 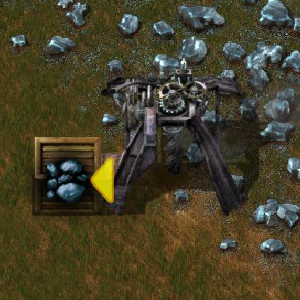 Fill the gap with a burner inserter in a way that the inserter can insert coal to the miner. 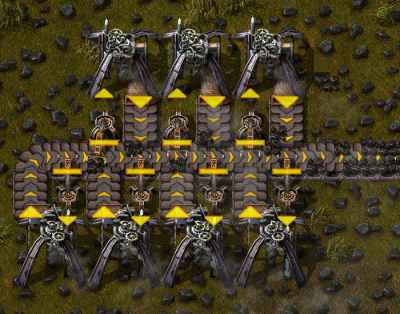 When placing this array of entities opposite of each other, ensure that no two burner inserters are trying to take coal from the same piece of belt or one of them might run out of fuel. Mining speed for all ores except uranium is now 0.25/s. Player starts with one burner mining drill and one furnace in the freeplay. Increased mining speed of burner mining drill. Mining drill evenly mines from every tile in it's area. This page was last edited on 12 March 2019, at 13:46.